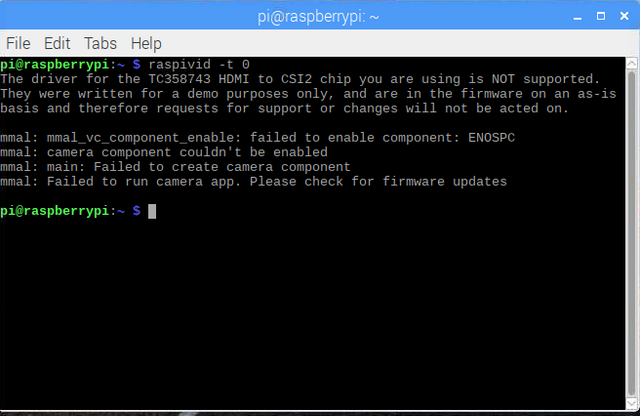 I'm trying to use an RPi 3b with the Auvidea B101 to take in HDMI output from a security camera. The security camera produces [email protected] and I'm feeding its analog output through a TVI to HDMI converter to produce HDMI. All I really want to do is take images from it on command, so video streaming is more than I need. I'm trying to use 6By9's changes. 1) I updated my kernel and updated the config.txt with dtoverlay=tc358743. Note also that I edited it with a regular text editor. Not sure if this is ok.
Device `unicam' on `platform:unicam 3f801000.csi1' (driver 'unicam') is a video capture (without mplanes) device. Unable to get frame rate: Inappropriate ioctl for device (25). Sent buffer 0x161a158Sent buffer 0x161a330Sent buffer 0x161a508Sent buffer 0x161a6e0Sent buffer 0x161a8b8Sent buffer 0x161aa90Sent buffer 0x161ac68Sent buffer 0x161ae403 buffers requested. Buffer 0/0 mapped at address 0x72553000. Buffer 1/0 mapped at address 0x7236a000. Buffer 2/0 mapped at address 0x722d4000. The file.h264 only has 27 bytes, so clearly it didn't work. One notable question that comes to mind is why the video format is set to 640x480. I suppose this is default for yavta? I also tried setting -s 1920x1080, but the output seemed the same. I would appreciate any debugging help! Thanks! 27 bytes are the header bytes of the H264 stream. Those get generated based on resolution, colour space, and a few other parameters before the first frame is required. The output resolution is driven almost solely by the DV_TIMINGS settings. You can't ask for a resolution other than the one set via the timings. The only parameters you should be able to change are the bytesperline and pixelformat (RGB3 or UYVY). Editing the EDID in a text editor is fine. I would use the edid-decode app (in the Raspbian repos, or https://git.linuxtv.org/edid-decode.git/) to validate that your EDID describes what you think it does. It sounds like the source isn't finding a mode that it likes. Try it with the 1080P50 EDID first and see what it detects/selects. yavta will get you nowhere until you solve getting the timings detected correctly. It may be worth picking up a cheap HDMI splitter so that you can see whether the camera is producing a sensible output when feeding the B101. I picked one up on eBay for around £10. @6By9 Thanks for your reply. I confirmed that the output of my camera is sensible by plugging it into a monitor. @6By9 is this what you meant for me to test? I'm assuming that you recommended an HDMI splitter because it would make it more convenient to test this (i.e. have the RPi output and camera output available simultaneously without swapping cables), but that the HDMI splitter is not strictly necessary. Given that the decoded 1080P30 file says: "[email protected] 16:9 (native)", I suppose it looks right, but this is the first EDID decoding I've ever looked at so I'm not sure. Sent buffer 0x2b5158Sent buffer 0x2b5330Sent buffer 0x2b5508Sent buffer 0x2b56e0Sent buffer 0x2b58b8Sent buffer 0x2b5a90Sent buffer 0x2b5c68Sent buffer 0x2b5e40Unable to request buffers: Cannot allocate memory (12). I wonder if it's because the frame rate is set at 60fps? Then again, I'm not sure why that would be since I set the EDID to have a native 30FPS (unless I'm misunderstanding the EDID). The splitter should merge the EDIDs from the monitor and B101 and put out a combined EDID. You can therefore verify that the source is putting something sensible out. HDMI has a hotplug line, and when that is asserted it will reread the EDID of the new device and choose a mode based on that, so when plugged in to your monitor the source may choose something totally different to the B101. Yes, it's pretty much the same for all EDID files if you're only changing the supported resolutions. Somethings been clipped off your quote then, as I only see "Pixelclock: 148500000 Hz ()". The numbers sound right for 1080P60 though. 1080P60 won't work except on a CM/CM3 with 4 lanes. The data rate is too high for the 2 lanes of CSI2 avaiable on a standard Pi. Ah, I may have missed a bit in my instructions. The video buffers are allocated from a special memory area called CMA (Contiguous Memory Allocator). You need to edit /boot/cmdline.txt to add/edit "cma=32M" to increase the allocation from the default 8MB. cmdline.txt must remain as one line - anything on a second line will be ignored. @6By9 Thanks for you help. So by HDMI splitter you must mean a 1-in multi-out device. For some reason I thought you meant a multi-in 1-out (which I understand now is an HDMI switcher, not an HDMI splitter)... Ok I'll feed the camera output into the HDMI splitter, then feed the 2 outputs from the splitter into my monitor and the B101. Just ordered the splitter. I added "cma=32M" to /boot/cmdline.txt, and rebooted. I tried to set my EDID for 1080P30 again, but I get the same result where it gets set to 60FPS. Sent buffer 0x18d2158Sent buffer 0x18d2330Sent buffer 0x18d2508Sent buffer 0x18d26e0Sent buffer 0x18d28b8Sent buffer 0x18d2a90Sent buffer 0x18d2c68Sent buffer 0x18d2e403 buffers requested. Buffer 0/0 mapped at address 0x70a04000. Buffer 1/0 mapped at address 0x70608000. Buffer 2/0 mapped at address 0x7020c000. Unable to start streaming: Invalid argument (22). @6By9 How do you suppose I can lower the FPS settings? That would seem to be the key here. HDMI splitter eg https://www.ebay.co.uk/itm/2160p-1-IN-2 ... 2496109965 or many similar ones on eBay. The one I have is an older version which only does 1080P and is powered from a USB socket. Not that it matters here, but they often don't support ARC or CEC. Splitting an HDMI stream is actually fairly involved, particularly if HDCP (copy protection) is involved. The keys are per device, so the stream has to be decrypted, split, and re-encrypted. Choosing a mode is totally down to the source. You can try hacking out all the extra EDID modes leaving only 1080P30 to reduce the choices it has, or there may be menu options to select the mode. There is nothing compelling the source to choose any particular mode, except the expectation that should the EDID not advertise it then the sink may not be able to cope with it. As an example, on a Pi you can use "tvservice -e " to choose any mode you fancy irrespective of the EDID. Your original post said the camera produced 1080P30. How had you determined that? It seems strange that if it is only 1080P30 that the DVI output is 1080P60, unless the camera is separated from the receiver/display via eg ethernet. 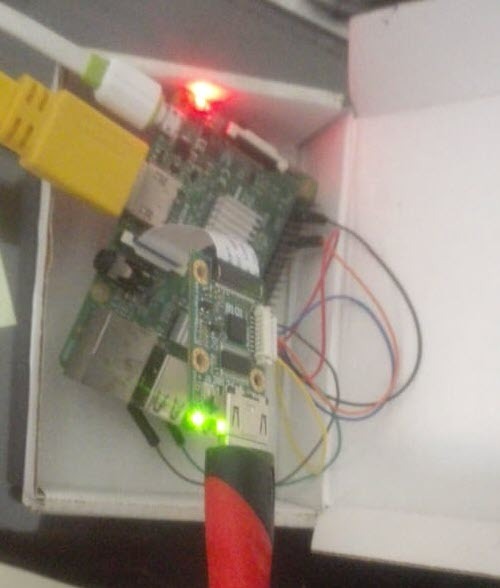 You could test the rig out using a Pi as the source where you can set the modes explicitly, and it will also abide by the EDID (It doesn't hot plug therefore the B101 must be setup with the EDID before you boot the Pi acting as a source). 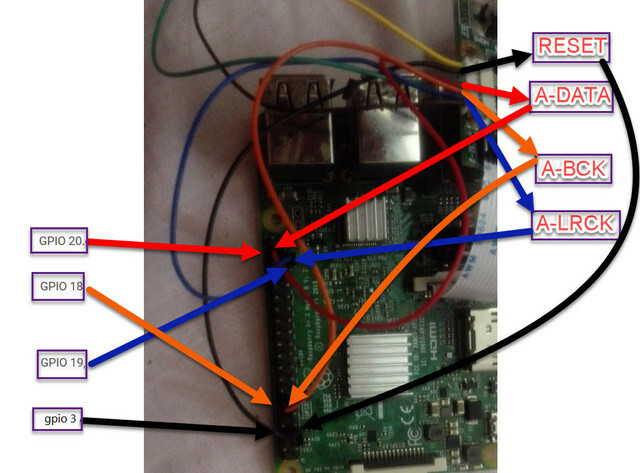 Given that this is the situation, is it possible to still get this setup to run with an RPi3? You noted in a previous post that: "1080P60 won't work except on a CM/CM3 with 4 lanes. The data rate is too high for the 2 lanes of CSI2 avaiable on a standard Pi." However, while it isn't possible to take in 60FPS, could the TC358743 sample at a lower rate from a 60FPS source? Truth be told, all I really want to do is take pictures with this camera. If I could get even 0.1 FPS, that would be great. The chip has a 512 pixel fifo to cover differences in hdmi and csi data rates. There is no way to arrange a 512 pixel fifo to store enough of the image to handle such a mismatch in data rates and give a full frame. I guess you could drop every other line, but I don't believe you'll be able to convince the chip to so that. I see. Thanks for the direct answer. What about 720P at 60FPS? That should be possible right? 720p60 uyvy should work. Rgb will still take it over the 1944Maps limit of the csi2 setup. Could you please guide me how to generate EDID files properly? For example [email protected] and [email protected] I read two files for full HD 50fps/60fps but didn't get the main difference between them. Thanks a lot for your help. Those two files contain a bundle of resolutions up to and including 1080p50 or 1080p60. Use edidparser or similar to interpret them.